"I was simplifying a complex issue without the right amount of education on the subject"
The 1975's frontman Matty Healy has apologized for comments he made about misogyny in rock'n'roll and hip-hop. Speaking to The Fader in a recent interview, Healy compared the past glorification of drug use in rock'n'roll and the current glorification of drugs in hip-hop, claiming that "those things get weeded out the longer those things exist." He went on to conflate drug use with misogyny in both genres, explaining that "misogyny doesn't happen in rock'n'roll anymore" because the longer the genre has been around, the more it has been "weeded out." "It still exists in hip-hop because the genre's so young, but it'll stop," Healy continued. Now, Healy has taken to Twitter to apologize for insinuating that there isn't still misogyny in rock music, as well as for sounding condescending towards hip-hop. In a string of tweets, Healy explained that what he had said was not correct, nor was it entirely a misquote, though the singer did clarify that he had meant that "misogyny wasn't ALLOWED in rock and roll now days in a way it is in hip-hop." 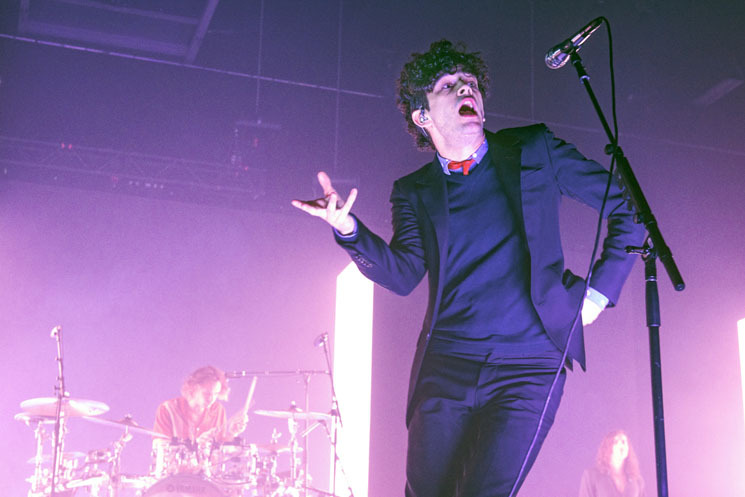 Healy went on to acknowledge that there has been rampant misogyny in the rock music world since its inception and admitted he is not educated or experienced enough to speak expertly on the subject, and as such, ended up "trivialising the complexities of such enormous, experienced issues." The 1975's new album A Brief Inquiry into Online Relationships is out now. I would never deny the RAMPANT misogyny that exists in Rock n Roll. It's everywhere and has been a weirdly accepted part of it since it's inception. So basically, I'm sorry for saying that as I was wrong. And thanks for pointing it out cos if I'm gonna do this I have to keep learning.